Allows you to charge site visitors money for viewing a video course and setting a subscription duration. The CM Video Lessons Manager Payments Add-on for WordPress supports adding payments support for Video Courses on your WordPress website. 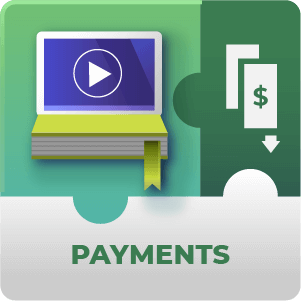 Payments or Subscription requirements can be applied site wide, to collections of videos or on a video by video basis. 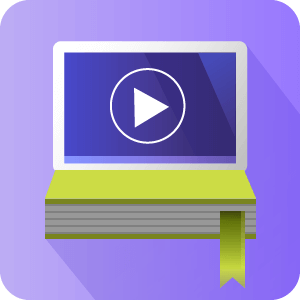 This level of control allows for providing some introductory course videos to your viewers free of charge and then restricting other course material to subscribed customers only. Site visitors can be directed to the subscription page on different parts of the site or menu to pay for the course. They can also be prompted to subscribe when attempting to view paid course content. Offer visitors access to course overview videos, course section introduction videos and taster videos. Then encourage interested customers to buy a subscription to access the full content of the course. Profit From Videos – Making videos demands a lot of resources. Make the most out of your investment and generate revenue from video lessons. Choose How to Charge – You can set a price for individual videos, collections of videos or the whole site. That way, it’s possible to apply different strategies to maximize monetization and conversion. Versatile Interface – You can choose from different parts of the website to direct users to the subscription page. This way, you can tailor the informations about payments according to the website’s navigation. EDD and WooComerce Support – The add-on supports both leading payments platforms. They enable your visitors to pay for content in hassle-free environment, using trusted payment gateways such as PayPal and credit cards. 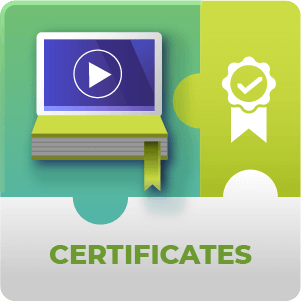 Expansible – Further enhance your video classes by offering your students proof of completion with the Certificate Add-on and testing their knowledge with the Quiz Add-on. The payments add-on for Video Lessons Manager works with either the Easy Digital Downloads or the WooCommerce payment platforms. By default these use PayPal which can also offer guest checkout so your users won’t need to log into a PayPal account to pay for video content. Can coupon codes be created to discount paying for Subscribing for content? How do I set the price of paying for video content? 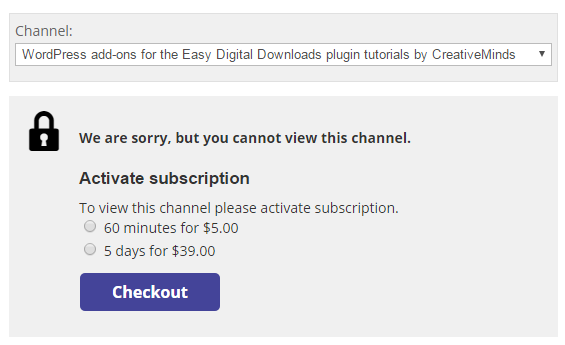 The price you charge for access to your Video content is controlled through the EDD Payments tab in the Video Lessons Manager Settings. Does this add-on allow me to charge on a video by video basis or only for all the content on my site? You can do either. 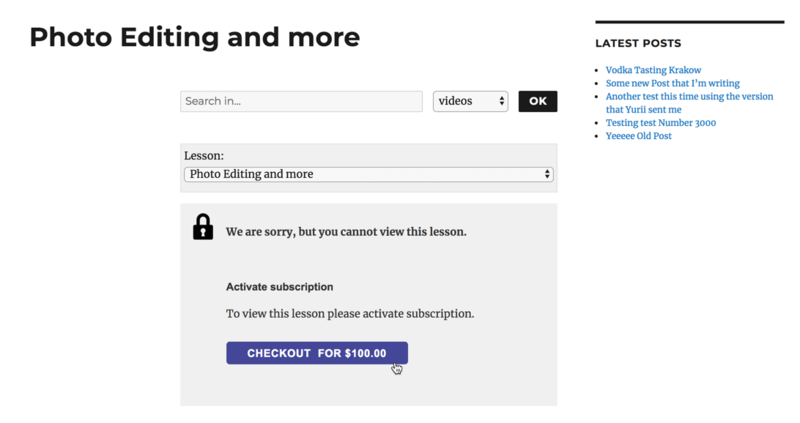 You can charge your users to view individual video lessons or you can charge them for access to all of the lessons on your site. Is there any way for me to integrate this with MicroPayments? Yes, the plugin integrates with the CreativeMinds MicroPayments plugin. By integrating Video Lessons with MicroPayments you can allow users to pay for video content using their MicroPayments points which they can either pay for using normal online payment methods or by performing certain actions on your site such as posting reviews or comments. By allowing users to pay with MicroPayments you can incentivize site usage and improve your visitor retention. How do my site users know how much time they have left to view video content? The subscriptions list shortcode which is included can be placed on any page on your site. Visiting this page will display a table of the videos that they are subscribed to and how much time they have remaining for viewing them. It will also provide them with a link when their viewing time expires. What can I charge my video lessons customers for? For one lesson at a time or for many? We currently facilitate charging users for either individual lessons (which can contain multiple videos per lesson), or for access to your entire collection of lessons and courses. To learn more about charging for individual lessons see this Help article. Made the WooCommerce products downloadable by default which will make WooCommerce to change the order status automatically to completed. 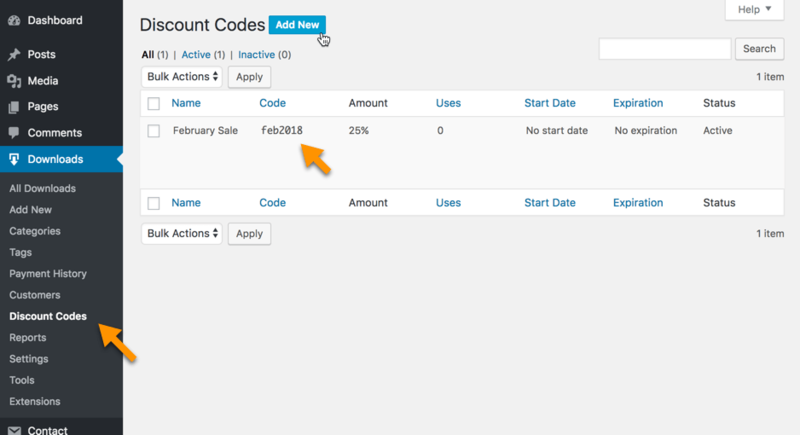 Preventing from showing the payment box on the lessons list if subscription is active. 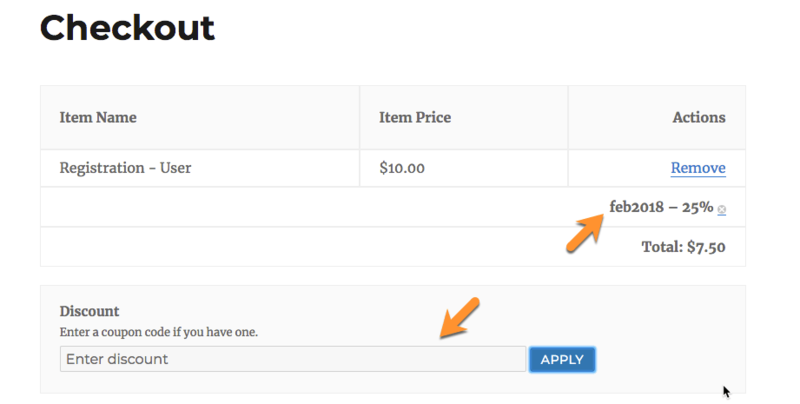 Fixed bug with adding the product to checkout twice. Fixed problem with showing backlink on the EDD receipt page. Enabled processing shortcodes in the guest text in the payment box. Fixed issue with showing payment box twice for non logged-in users. Fixed activating the subscription after buying EDD standalone products. Fixed problem with version number and updates appearing.